There are over 38 million people who wear contact lenses in the United States, but nearly a quarter of those never replace their contact lens case. If you're one of those folks, you probably have a drawer full of empty, unused lens cases in your home. Start putting them to good use! If you're sick of stealing condiment packets from your local fast food joint to take in your lunch, a contact lens case can help. Just wash it out and store your ketchup and mayonnaise inside for a travel-friendly condiment holder that also doubly serves as portion control. 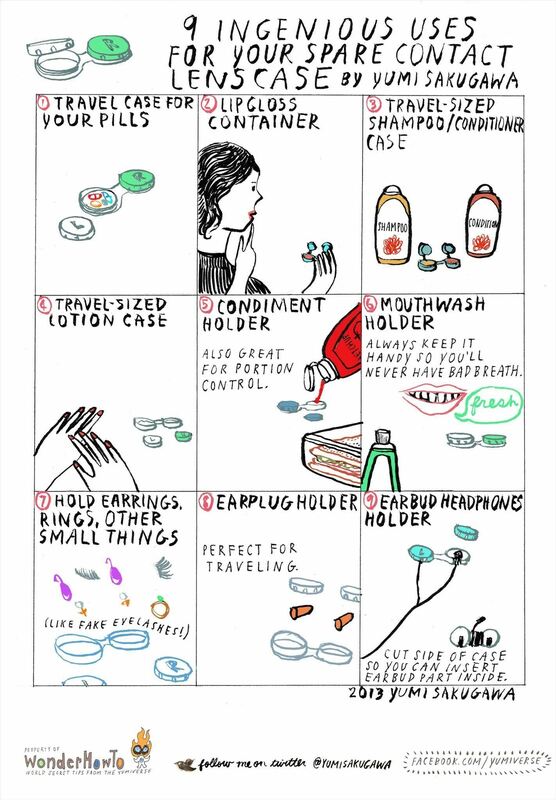 Other than edible liquids, a contact lens case is also perfect for storing pills, lip gloss, shampoo and conditioner, mouthwash, small earrings, and other tiny things that can easily get lost on the go or while traveling. Need a handy earphones holder? Simply cut a wide-enough gap on each side of the contact lens case where you can insert your earbuds inside the reservoirs. Screw lid on top and wrap the rest around the center of the case for perfectly organized headphones! Got your own ingenious uses for spare contact lens cases? Share with us.